It may be expensive and crowded, but the Tower of London is worth a few hours of your time. The Crown Jewels are a must-see and do be sure to take a (free!) tour with one of the Yeoman Warders (Beefeaters). The tours are popular and may be large, but our Yeoman Warder had a booming voice and was full of stories and jokes about the Tower of London. 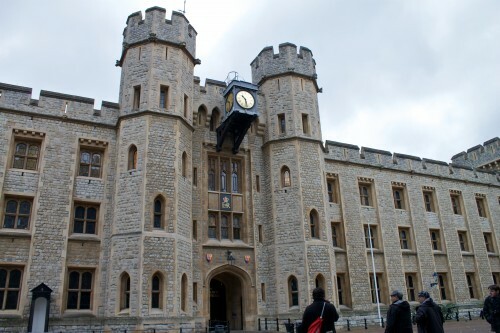 Other than that, see anything that sounds interesting – we visited the White Tower (it houses the Royal Armories’ collections), walked a portion of the wall surrounding the Tower of London, and spent some time looking at torture devices in the Lower Wakefield Tower. Don’t forget: depending on when (time of year) you’re visiting, you may be able to take advantage of the 2-for-1 tickets – we only paid £20.90 for the two of us. An extensive collection of artifacts spanning human civilization, the British Museum is a perfect escape from a dreary London day (and it’s free!). For a quick trip, I recommend following Rick Steves’ guide (found in his London book or here, where you can download an audio version). He goes through the essentials – Egypt, Assyria, and Greece – and provides information about the key items in each section. With more time, explore exhibits focusing on cultures from all over the world: Ancient and Imperial China, Ancient Rome, Incas, and Aztecs, to name a few. In addition to the permanent exhibits, the museum has temporary exhibitions that may be worth a visit (flowers and plants from North America were being featured while we were there). The entrance fee (£18) to Westminster Abbey includes an audioguide with 20 listening points throughout the interior. As you walk in through the north transept, you have a view of the breathtaking nave – the ornate vaulted ceiling was the show-stealer of Westminster Abbey. It was very impressive and something that has to be seen in person (the pictures don’t do it justice). A substantial portion of the tour took us to various tombs, including that of Queen Elizabeth I and Kind Edward the Confessor (he built the original Westminster Abbey). 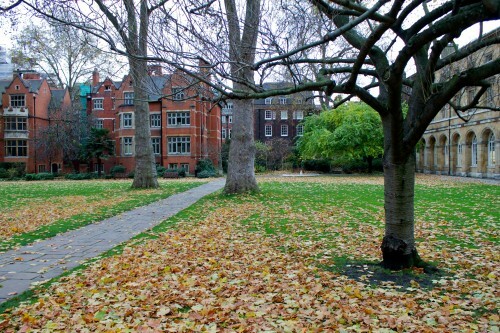 We finished our visit outside in the Cloisters, and then continued to the Little Cloister and College Garden (pictured above – according to Rick Steves it is only open Tuesday-Thursday). The entrance fee (£15) to St. Paul’s Cathedral also includes a free audioguide and access to both the dome and the crypt. We started out in the nave, made our way around the spacious church, and then started up the stairs leading to the dome. If you are physically able, there are about 500 or so stairs that lead up to the top of the dome and I highly recommend the trip. The first level (about 250 steps up) brings you to a walkway around the inside of the dome, overlooking the church interior. The second and third stops are outside of the dome, with sweeping (and windy) views of London. We finished our visit down in the crypt. We started in a room with the Oculus, 270° film that shows the history of St. Paul’s Cathedral, and finished by admiring the numerous tombs of famous people. A visit to St. Paul’s Cathedral is definitely worth 1.5 hours during your trip! I wrote about the markets in more detail here, but they were so enjoyable that they deserve another mention. Even if you don’t plan to purchase any souvenirs, bring your appetite and plan to have lunch or a snack while browsing the offerings. Remember to visit Borough Market on Thursday-Saturday and Portobello Market on a Saturday to enjoy the full-blown markets. 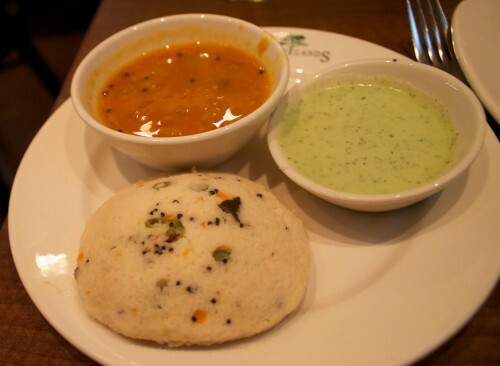 Ryan wrote about the two Indian restaurants we tried in London and I think it’s safe to say I wouldn’t have minded trying more. I wasn’t familiar with the vegetarian dishes found in southern India, so I welcomed the chance to taste something new (the picture to the right shows my appetizer from the dinner – vegetable masala idli: steamed rice and lentils with mixed vegetables) . Next time I visit, I plan to expand my palate even more – either by choosing more adventurous dishes from the menu or trying a new cuisine (such as Pakistani). Don’t miss a spicy meal in the land known for bland food! Whether it’s cream tea (just tea and scones) or a full-blown afternoon tea (tea, scones, pastries, sandwiches, and champagne, if you wish), an afternoon tea break to unwind is a must! Not only is it fun to take part in an English tradition, but sitting down to tea is a great break from walking around and serves as a snack to tide you over until dinner. 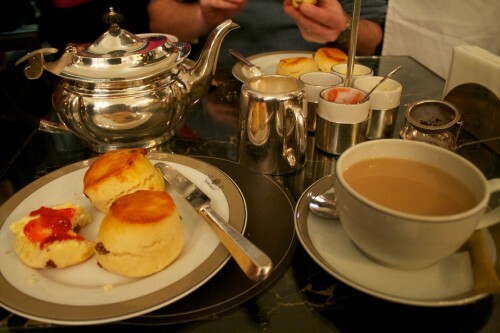 The picture on the left is from our cream tea at The Wolseley. Some of the well-known tea rooms include those at The Ritz, Fortnum & Mason, and Claridge’s, but tea rooms can be found almost anywhere (including department stores and book stores), ranging in prices. Along with Broadway shows in New York, musicals in London are another must-see. Known for it’s great theater district, London has several famous shows to choose from each night. We planned to see Les Misérables and purchased tickets ahead of time, but for another trip I would consider getting half-price tickets the day of the show. Ryan provided information for anyone considering a show (whether you choose to book ahead or try out the half-price tickets, his post will be helpful). Plan a fancy night out, with a pre-show drink and a late-night post-show dinner! This plan leaves some time to wander around, stop at a pub or two, and add extra sites as you see fit. Enjoy your trip to London! This entry was posted in Recommendation, Things To Do, Travel and tagged England, Europe, London, London 2012 Trip, travel, travel planning, UK by Kristin. Bookmark the permalink.